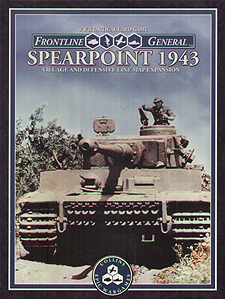 Frontline General: Spearpoint 1943 Village and Defensive Line Map Expansion is a terrain expansion to our fast-paced WWII card wargame, Frontline General: Spearpoint 1943, while also serving as an expansion for a future game in the Spearpoint 1943 line, Frontline General: Spearpoint 1943 Eastern Front. Immersion is the goal as you dive into fictional intros by author Mark H Walker, realistic artwork by German artist Marc von Martial, and well-tested rules that seamlessly tie it all together with the original game and its components by designer Byron Collins. Play new tense Standard Games and Situation Games that set up differently every time using versatile die-cut terrain tiles such as buildings, ruins, minefields, bunkers, trenches, and more! Optionally play using 15mm miniatures.